Scroll Pens are advertising pens, which can pull the scroll out to see more details of the sponsor's informations. Click the above image to see big pictures with details. These Promotional Banner Pens are Unique New Concept! Banner Pens are the latest innovative promotional gifts that are both functional and informative. They are used as corporate printed pens, trade show give aways, promotional product items, charity products, business items or a unique business card. Those Banner Pens have immediate impact. The promotional products buyer is always looking for a new standout concept that will really grab people's attention. The brochure pen has just hit the market and new adopters are extremely happy with the response from clients, prospects and members. Unlike traditional giveaways that people swiftly forget about, these promotional Banner Pens are something that will keep on selling, informing and educating your prospects for months. 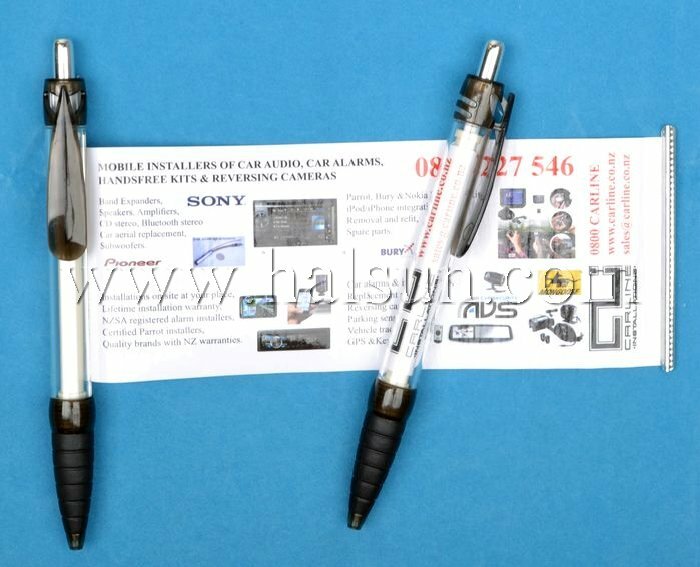 Importantly these Banner Pens are inexpensive option compared to many other promotional pens. We are professional promotional gifts supplier, you can see some of our Banner Pens reference clients. .